I’m still here, waiting, sometimes patiently, sometimes not, for the baby to arrive. 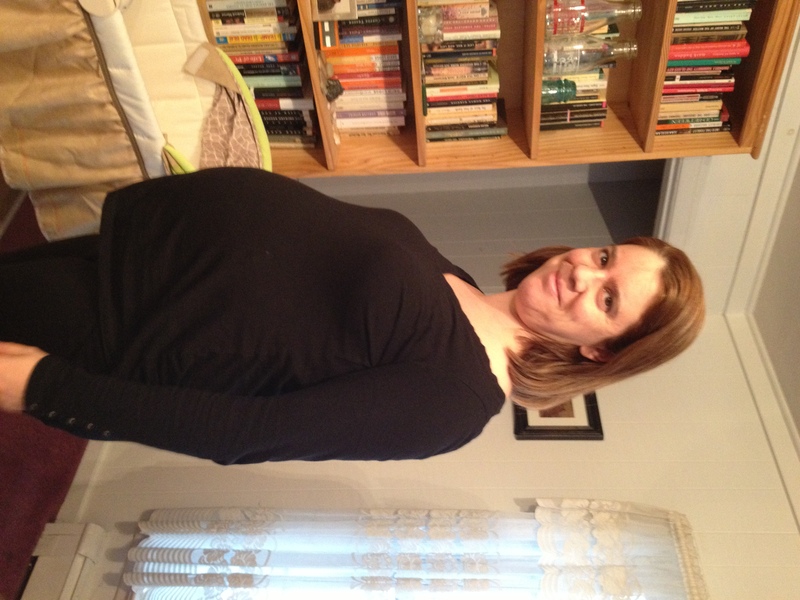 I’m not due for two more weeks, but I’m far enough along that it could possibly be any day now. I’m excited, but I also spend my time in a little bit of a haze: I read some, I sleep a lot, I take walks now and then, I panic about whether I’m ready and reorganize the baby’s clothes once again. I’m watching Hobgoblin and other teacher friends return to school after winter break, and it feels strange not to be working on my own syllabi. So here are some very brief thoughts about what I’ve been reading. I’d love to write longer reviews … except that’s a lie, because I’m feeling lazy and wouldn’t really love it. Brief thoughts are all I have ambition and energy for. Barbara Comyns’s Who Was Changed and Who Was Dead. I put this on my list of my best books of 2012, but I wanted to mention it again here, as I read it right at the year’s end. What a fabulous book! Comyns has a wonderful style and creates a marvelously strange atmosphere. It reminded me of Shirley Jackson, although Comyns is less gothic. I’m looking forward to reading her other books and now have The Vet’s Daughter on its way here. Megan Abbott’s Dare Me. I listened to this one on audio and liked it. It’s about a group of high school girls on a cheer leading squad and a new coach who comes in and transforms their lives. The book is forthright about the combination of vulnerability and cruelty, especially the cruelty, of young women at this age, which I admired, but I loved the depiction of female athleticism and what it means to the characters to train hard and transform their bodies for competition. Lauren Groff’s Arcadia. This was a very absorbing read and very well-written. It’s about a commune in upstate New York and tells the story of Bit who spends his childhood there. It’s more accurate to say that the book is about Bit himself, because it follows him after he grows up and leaves Arcadia, but, unsurprisingly, Arcadia haunts his entire life. The novel is well-written, Bit is an appealing character, and the ideas the novel explores about utopian societies are interesting. Jamaica Kincaid’s Annie John. I approached this book as a novel, so I was surprised to see Sven Birkerts mention it as a memoir in his book on the subject. Perhaps the book combines elements of both genres. At any rate, it’s a very good book. It’s a coming-of-age story and focuses on Annie’s relationship with her mother, first with their closeness and then their growing estrangement. The outlines of the story are not unique, but it’s particularly well-told and moving. Madeline Miller’s The Song of Achilles. I liked this retelling of Achilles’s story very much. It’s from the point of view of Patroclus and focuses on their relationship. The novel makes the familiar story of the Iliad feel fresh and new. Nicholson Baker’s The Way the World Works. This is a collection of essays, some of which were fabulous, and some of which left me thinking, huh? I should care about this why? These particular essays could have benefited from a little context, more explanation of why they were written and how they fit into the magazine or book collection they were originally written for. Baker is fascinated by the everyday stuff we are surrounded by, and I admire that quality in him, but sometimes he doesn’t convince us that his preoccupations might be our preoccupations as well. But then some of the essays are great, particularly the ones that are longer and more in-depth, where we get a sense of why his subject matters. Rachel Cusk’s A Life’s Work: On Becoming a Mother. I was inspired to check out a couple memoirs about motherhood from the library recently, and this is the first one I read. I also found Anne Enright’s Making Babies: Stumbling Into Motherhood, which Hobgoblin picked up and read immediately. He laughed his way through Enright’s book, while I read Cusk’s account of motherhood with growing anxiety. I admired the honesty of Cusk’s book, but her experience was very difficult. I can only hope mine won’t at all be like hers, although if it is, I’ll look back at her book and find comfort. Lastly, Eric Ambler’s A Coffin for Dimitrios. We are discussing this book at my mystery book group meeting this weekend. I enjoyed the novel very much, although I found its structure odd: it’s a thriller, I guess, but surprisingly long chunks of it are made up of people sitting around talking. There isn’t a whole lot of action, or at least not as much as you might expect. But the story itself is a good one, and the novel is very writerly as well: the main character is a crime novelist who decides he wants to investigate a crime himself, and so there is a lot of discussion of novelistic vs. real-life crimes, criminals, and crime narratives. That’s a lot of fun. I have to tell you that everyone here is excited to the point of bursting and I shall probably have to tie them down before the next fortnight is over. You don’t need me to tell you that we’re all hoping things go really well and really smoothly. From your reading list, Comyns is someone I’ve been intending to read for sometime and I will add this to my library requests straight away. The same is true of the Miller, but that is coming up for one of my book groups later in the year, so I’m putting it off until then. The one that I’m really interested in is ‘Arcadia’ so I’m off to the library site to see if they have a copy straight away. Thanks and take great care. Thank you, Alex! We’re so excited here too, as well as anxious. It would be so nice if I could know what day the baby will arrive! I think you will like Comyns, and I hope you enjoy Arcadia. I think I’ve been lucky in my reading material lately! Your reading indicates you have not been lazy at all! You are so close, and seeing how baby might arrive at any time now, I wish you a speedy delivery, a happy healthy you, and a beautiful healthy baby! Baby could be here any day now! Such an exciting time. I wish you the best of luck with your delivery. In terms of the books you listed, I really want to read the Madeline Miller! I just requested it from the library yesterday so will hopefully get to it soon. Marg — thanks! I hope you enjoy the Miller; it really is an impressive book. Looks like you have been getting some lovely reading done! Best of luck for the coming days and weeks – I will be thinking of you, Hob and your new arrival. Thank you, Charlotte! I appreciate the thoughts. I think I’ve been lucky in my book choices lately, which has been fun. Awww: I hope your motherhood experience turns out closer to Enright’s too. And I’m keeping you in my thoughts, wishing you & the baby & Hobgoblin well on the big day! Bookishly speaking, I’m disappointed that my library doesn’t have Who Was Changed and Who Was Dead or any other of her books. I’ll just have to ILL it! Thanks, Eva! I think Comyns is worth the effort to track down. She should be more widely known! Don’t worry too much! Cusk is indeed very dark and frightening, but hey, it’s a book! I wish you a speedy delivery and all the best for the coming events. Take it moment by moment, day by day, hour by hour, and remember: nothing in motherhood is permanent, the worst and the best! Will have to look for the Comyns. Attitude has a lot to do with the first few weeks–just expecting things to go well seems to help. Wishing you and Hobgoblin all the joy and awe of a newborn! Nice photo. Your baby bump is well-developed. I hope you have a smooth delivery and a healthy young’un to dote over. Our friend had a New Years baby and we are going to see them soon.